When coffee-lovers switch from pumpkin spice to eggnog lattes, you know it’s the holiday shopping season. This year we are seeing big transformations in the major shopping centres in Ottawa, but 2014 is also bringing more festive fun with lots of Christmas markets and craft shows appearing across the city. A trip to any one of these holiday troves will have you picking one-of-a-kind gifts and supporting local. In fact, we love these hyper-local events that showcase one-of-a-kind, often hand made, gifts so much that we shone a spotlight on Made in Ottawa products in our Winter 2014 edition feature, “Local Love.” It was through tracking down cool vendors and exploring the local craft scene that we realized many of these business owners only sell through events like those listed below. If you love local, handmade gifts, make sure to get your hands on that issue! Many are participating in these markets — check out Ottawa Magazine tips for highlighted vendors to look for. 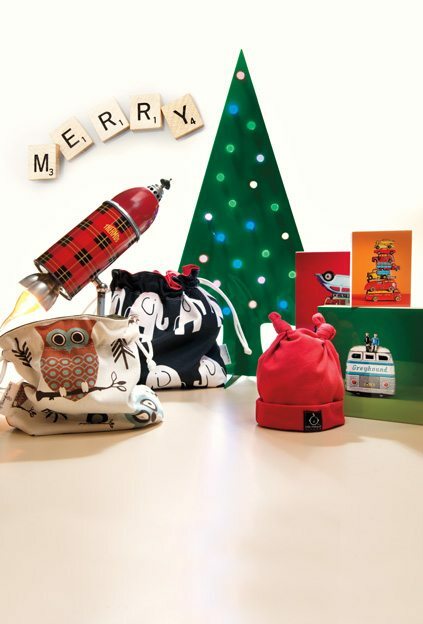 This photo from the Local Love gift guide in our Winter 2014 issue shows products by My Stow-n-Tow, Rekindled Lighting, Andrew O-Malley, Julie Thibault, and Becca Wallace. Photo by Marc Fowler – Metropolis Studio. Partial proceeds from this display of local artisanal work will go to the Ottawa Food Bank and other local charities. Love thy neighbours and bring non-perishable items for the community and you will surely be on Santa’s nice list. Admission is free but non-perishable food items are welcomed. OM Tip: Did you (or someone on your Christmas list) see the Local Love gift guide in the Winter edition of Ottawa Magazine? It featured artists Becca Wallace, Heart Meets Paper, Littlest Bird Workshop, Split Tree Cocktail Co., and Janie & Pamalamalas will be at the Capital Pop-Up. The OVCC’s Christmas market is self-described as “a unique mélange of traditional, steampunk and geek, all served up with a cup of good cheer.” They’ll have something for everyone, including beautiful cards from Sarah’s Card Company, made by our good friend and former Shop Talk contributor Sarah Fischer. Admission is free. OM Tip: Look for Violeta Creations and Rekindled Lighting, who appeared in the Winter 2014 edition of Ottawa Magazine, at the OVCC Christmas Market. Where: Glebe Community Centre, 175 Third Ave.
What we love about local craft shows is the community feel, and if you’re looking for a boutique experience then look no further than this handmade fair at the Glebe Community Centre. (This indie craft show is part of the Capital Craft Crawl on November 22, along with the two previously mentioned events.) Admission is free. OM Tip: Find Local Love featured artists Purple Urchin, Top Shelf Preserves, and High Tide Bowties at this event. Christmas spirit has arrived at one of our most treasured national museums, as it celebrates the season with its very own Christmas market. In its fifth year running, the marketplace will include 70 exhibitors scattered in the magnificent Grand Hall. Admission is free. OM Tip: Local soap producer Purple Urchin will be there to help you select their deliciously scented natural products. Shop gifts for the art lover on your list at Baz’Art, where you will find ceramics, jewellery, painting, and photography by local and regional artists and artisans, carefully selected by jury. As this is an event at the Shenkman Arts Centre, you will hear the sounds of live performers as you peruse the amazing showcase of artistic talent. Admission is free. OM Tip: If you find all that art to be inspiring, look into joining a workshop at the Shenkman Arts Centre. Available workshops include painting, jewellery making, pottery, and a dance holiday flashmob for the Santa’s Parade of Lights! A Sunday visit to Brewer Park is a ritual for many, who will be pleased to know the outdoor marketplace will be heading home for the holidays at Lansdowne Park in the Aberdeen Pavilion. The old “Cattle Castle” will be transformed into a Christmas Market and beaming with festive flair, filled with holiday music, decorations and Christmas trees. More space means more vendors, who will all be competing for the best decorated stall for the holidays. Gift vendors will leave you with a lot to choose from with handmade crafts, jewellery, woodwork, toys and accessories. Of course there’s always the food, so shop for local and seasonal ingredients for your holiday feasts or purchase some ready made goods. Admission is free. OM Tip: Come out on opening day on November 30 at 10:30 am. There will be a traditional burlap ‘ribbon’ cutting ceremony, followed by hot apple cider and holiday desserts. A favourite show amongst the hip and modern is the Urban Craft Market that is promising the biggest and best show yet with its Holiday Edition. The craft bash will showcase more than 50 indie craft vendors from Ottawa, Toronto, Montreal and beyond. Admission is free. OM Tip: Find out more about Urban Craft vendors Dapper Beard Oil, Heart Meets Paper, Becca Wallace, Janie & Pamalamalas, Purple Urchin, Split Tree Cocktail Co. and Top Shelf Preserves in our Winter 2014 issue. The ByWard Market is a bustling marketplace all year round but it really comes alive for the holiday season. Celebrate the season outdoors with free wagon rides and hear the sounds of joy from the Christmas carollers at the corner of William and York. Admission is free. OM Tip: You’ll find many vendors outside but don’t miss exploring the ByWard Market Square for some local gifts at Eclection and Tickled Pink (also a good option if it’s -30 degrees!). OM Tip: Don’t be left out in the cold! Originals is closed on Dec. 15. Where: Shopify HQ, 150 Elgin St.
Have you been curious to see the new Shopify office? Well here’s your chance to check out the new digs, as the Ottawa e-commerce company is having its very own Christmas Market. Several Shopify e-stores will be selling face-to-face, including Strut Jewelry, Darling & Dapper, Tealee, The Beard Co., MainStreetKnits, High Tide Bow Ties, Darling Yes, and Scrub Inspired. As this is a high tech bunch, they will accept credit cards at the booths with their iPhones and iPads. OM Tip: Take advantage of the Christmas wrapping booth. Wrapping is on the house but donations for local charities will be accepted. Kelsey Kromodimoeljo is the Sales Coordinator for Ottawa Magazine and loves the ins and outs of working for a magazine. In her spare time, she can be found exploring the local food and shopping scene. Follow her on Twitter @kelseykromodi.